Rain was the story again on Monday, with the Wimbledon junior championships again hit by delays, preventing the completion of the first round of singles. 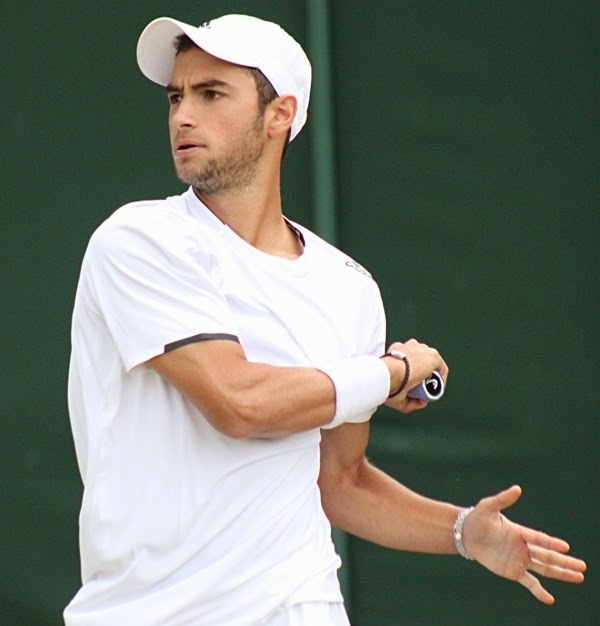 American Noah Rubin was relieved to have completed his match, and not just because his 6-2, 6-4 victory over British wild card Jamie Malik was completed within minutes of the day's second rain delay. "This was a pretty important match for me," said the 18-year-old New Yorker. "This is my third year, and I didn't want to go down three years in a row in the first round." Rubin lost to Luke Bambridge of Great Britain last year here 3-6, 6-4, 9-7, so negotiating a tricky spot in the second set was particularly important to him on Court 4 today. Serving at 2-3, 0-40, Rubin reeled off five straight points, then broke the 17-year-old Malik's serve in the next game for a 5-3 lead. "That could have been very dangerous," said Rubin. "He has a very good serve, so I knew if I didn't get that game back, it would have been difficult to come back in that set. To be honest, I don't want to go to three in England, with a Great Britain kid, and I got that game back, was serving well, so I was fortunate." Malik saved two match points serving at 3-5 in the second, using his substantial power well, but he was simply too erratic to pressure Rubin consistently. With Rubin serving for the match at 5-4 30-all, Malik netted a backhand during a neutral rally, and despite getting a second serve to return on the next point, put his forehand long to give Rubin the match. Rubin's second round opponent is reigning Eddie Herr champion Kamil Majchrzak of Poland, the No. 12 seed, who defeated Joao Menezes of Brazil 6-1, 6-2 between the two rain delays. Asked about not being seeded despite his ATP ranking of 539 (which should have earned him a 13-15 seed) Rubin admitted he didn't understand why, but wasn't going to dwell on it. "I've learned that no matter what, if you want to win the tournament, you have to beat everybody," said Rubin. "I don't care if I'm the first seed, I don't care if I'm a qualifier. If I want to hold that trophy at the end, I have to take on everybody. So whether I get the toughest round in the first round or get the toughest round in the finals, that's up for them to decide. I believe in my game and I believe whoever I play I can have a good chance against. I understanding the seeding, and maybe there was some confusion there, but it's not really a big deal for me." Two Americans gave both the top seeds a battle, but fell in three sets. Henrik Wiersholm, playing on Court 19 before the rain began, needed a set to get going against French boys champion Andrey Rublev of Russia, but found his form in the second set, before falling 6-1, 4-6, 6-4. The volatile Russian seemed to lose his concentration in the second set, but he regained it in the third, digging out of a 0-40 hole serving at 1-2 in third. Rublev then broke Wiersholm to take a 4-3 lead, and that was all he needed, although Wiersholm made him serve it out by holding from 0-40 down at 3-5. Wiersholm did have a glimmer of hope in the final game, winning the first two points, the second with a backhand return of a good serve so perfectly struck that Rublev dropped his racquet in disbelief. But Wiersholm was wrong-footed on the next point and missed a second serve return long to pull even. A good serve and forehand combination gave Rublev his fourth match point and he converted it with a forehand winner, running his current winning streak to 17 matches. Kaitlyn McCarthy also lost her first set to Ivana Jorovic of Serbia in a hurry, but she too fought back before falling 6-1, 4-6, 6-3 to the ITF world No. 1. McCarthy took a 4-1 lead in the second set, lost her break of serve, with Jorovic breaking and holding for 4-all. McCarthy saved two break points in her next service game, hitting a couple of forehand winners to fight her way to 5-4. Serving to stay in the set, Jorovic went down two set points after a wild forehand, saving the first with a forehand winner. But McCarthy made a difficult and unexpected slice that forced an error from Jorovic on the second set point, and the match, Jorovic's first on grass due to her absence from the Roehampton Grade 1, was even. It stayed that way until 2-all, when McCarthy saved two break points but not a third. The heavy hitting from both players made for some excellent rallies, but once Jorovic took the lead, she didn't face a break point and broke McCarthy on the fourth match point to secure the win. Jorovic had played McCarthy last summer at the ITF Grade 1 in Canada, beating her easily in the second round, and she was impressed by the improvement in the North Carolina 16-year-old's game from then. "I played her last year and it was like 6-2, 6-1 and this time she is a better player now," said the 17-year-old right-hander, who has a weapon in her two-handed backhand. "She's improved her game a lot and she's a good player." Despite her praise for McCarthy, Jorovic was unsure what led to her loss of the second set. "In the second set, it was new balls and it was a little bit different," Jorovic said. "I was down 4-1, but I stayed positive and came to 4-all and, I don't know, something happened. In third set, I'm trying to play my game like in first set, and it was very good, the third set." Jorovic will play Paula Badosa Gibert of Spain in the second round, who isn't seeded here, but like Jorovic, has a WTA ranking in the top 500. They played in March, in the first round of a $25,000 event on clay in Brazil, with Badosa winning it 6-3, 3-6, 7-5. "I lost to her 7-5 in third set, so tomorrow I expect a big match and I will fight and we will see," said Jorovic, who is scheduled to play on Tuesday, despite the 37 first round matches that have yet to be completed. Despite only 20 first round singles matches finishing on Monday, there were a few upsets. Tim Van Rijthoven of the Netherlands defeated No. 15 seed Jumpei Yamasaki of Japan 6-1, 6-2 and Petar Conkic of Serbia, brother of former Tennessee Volunteer Boris Conkic, won a rain-delayed match with No. 16 seed Daniil Medvedev of Russia 3-6, 7-6(5), 2-1 ret. So far, more boys seeds have lost (4, with Quentin Halys of France and Orlando Luz of Brazil losing Saturday) than have won, with only Rublev and Majchrzak advancing to the second round. In the girls draw, Katie Boulter of Great Britain defeated No. 13 seed Priscilla Hon of Australia 6-3, 6-3. Hon is the only seed out in the girls draw. Of the American juniors in action Monday, Rubin was the only winner. In addition to Henrik Wiersholm, Raveena Kingsley fell to Simona Heinova of the Czech Republic in the completion of a suspended match 7-6(1), 6-4, and Katrine Steffensen lost to Slovakia's Viktoria Kuzmova 6-4, 6-4. No. 7 seed Francis Tiafoe was serving for the first set at 5-4 against Slovakia's Martin Blasko when the third and final rain shower arrived, and despite the removal of the tarps covering the courts, play never resumed. With the drizzle arriving, No. 11 seed Michael Mmoh wanted play stopped when he was serving at 2-2 in the first set in his match with German Jan Choinski of Germany, as he slipped at least twice. It wasn't until after Mmoh dropped his serve however that the umpire granted the request. In something of an oddity, one junior match continued on when all the rest of the contests, seniors and junior alike, were cancelled. On Court 19, Ipek Soylu of Turkey, who won two $10,000 ITF women's circuit titles last month but needed to qualify to reach the main draw in the juniors here, ended the hopes of British wild card Jodi Burrage, much to the disappointment of the large crowd gathered for the only live tennis outside Centre Court. The 15-year-old Burrage, who had gained some notoriety in beating the reigning Wimbledon women's champion Marion Bartoli in an exhibition less than two weeks ago, could not quite match the confident Soylu, who is 390 in the WTA rankings and three years older than Burrage. The order of play for Tuesday includes the remaining 37 first round matches and 12 second round matches, with the latter scheduled later in the day. The weather forecast is better for Tuesday, but it must be said that the rain on Monday was not predicted to be as widespread or as disruptive as it turned out to be. For Tuesday's order of play and the draws, see the Wimbledon website. Middle Sunday at Wimbledon is a tradition that can be frustrating for fans and players, particularly when the tournament is behind schedule, but for those who work a grand slam, having a day off in its midst is much appreciated. 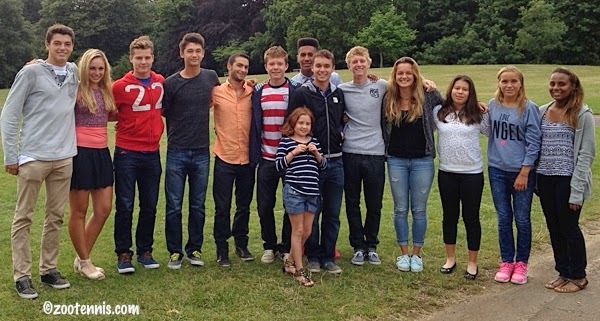 The USTA took advantage of the unique day to host a reception at Cannizaro House, just off Wimbledon Common, for the Americans competing in the junior draw, along with their coaches and family members. Dave Haggerty, the current USTA president, CEO and chairman, has been hosting these Team USA events at every junior slam since last year's French Open, and when he learned last month that I would be at Wimbledon this year, he invited me to attend. In addition to Haggerty, USTA Executive Director Gordon Smith was there, as was board member Tommy Ho. Patrick McEnroe, General Manager of Player Development, Jay Berger, head of men's tennis, Ola Malmqvist, head of women's tennis, and National coaches Nicolas Todero and Leo Azevedo were also at the late afternoon gathering, which was only dampened by the occasional brief shower. Most of the juniors attending had yet to play, after Saturday's rain had allowed only seven junior matches to be finished. Logan Smith, Alex Rybakov and Dasha Ivanova were among the seven winners Saturday, so they have Monday off, but most of the other US juniors are scheduled, some of whom will not get on until late in the day, with six matches planned for some courts. Raveena Kingsley who had her match with Simona Heinova of the Czech Republic suspended Saturday, having lost the first set in a tiebreaker and at 3-3 in the second set, is not on Monday's schedule (UPDATE: as of Monday morning, the suspended junior matches have now appeared on Monday's order of play). 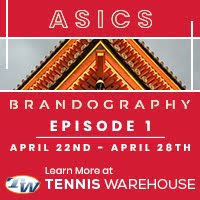 Kaitlyn McCarthy, Sofia Kenin, Usue Arconada, Tornado Alicia Black and Katrine Steffensen are scheduled to play Monday, but CiCi Bellis and Michaela Gordon are not. All the US boys--Francis Tiafoe, Stefan Kozlov, Michael Mmoh, Taylor Fritz, Dennis Uspensky, Noah Rubin and Henrik Wiersholm--are scheduled for their first round matches Monday. A few first round doubles matches are usually played on Monday, but with the courts so busy with professional matches, they will wait until Tuesday at least. The draws and order of play for Monday can be found at the Wimbledon website. Four Americans claimed singles titles today, three on the USTA Pro Circuit and one in Canada. Jared Donaldson won his third straight Futures title, winning the $15,000 tournament in Oklahoma City. The 17-year-old, seeded sixth, defeated unseeded Andrew Harris(Oklahoma) of Australia 6-3, 6-2 in the final. Top seeds Mackenzie McDonald(UCLA) and Martin Redlicki won the doubles title, beating No. 3 seed Jesus Bandres(East Tennessee State) of Venezuela and Gonzalo Escobar(Texas Tech) of Ecuador 4-6, 7-6(3) 10-8. Unseeded Connor Smith(Ohio State), won his second Futures title, claiming the championship of the $10,000 tournament in Rochester, NY. Smith defeated No. 6 seed Jean-Yves Aubone(Florida State) 6-2, 6-3 in Sunday's final. Smith also collected the doubles title with Daniel Nguyen(USC), with the No. 4 seeds defeating top seeds Liam Broady and Luke Bambridge of Great Britain 6-3, 6-3. It was Smith's third straight Futures doubles title with his third different partner. In the $15,000 Futures in Canada, No. 3 seed Dennis Novikov(UCLA) defeated top seed Filip Peliwo of Canada 1-6, 6-4, 6-4 to take the title, his third Futures title. Rik De Voest of South Africa and Matt Seeberger(UC-Santa Cruz) won the doubles title, beating No. 3 seeds Hans Hach of Mexico and Brayden Schnur(North Carolina) of Canada 5-7, 7-5, 10-5. Katerina Stewart and Josie Kuhlman met in the final of a $10,000 women's Pro Circuit tournament for the second week in a row, and again it was Stewart coming out on top. The 16-year-old from Florida, seeded No. 5, downed unseeded Florida recruit Kuhlman 6-1, 7-6(2) in Charlotte, NC. Stewart has now won three $10,000 titles, all since March. No. 2 seeds Lena Litvak(Harvard) and Alexandra Mueller won the doubles title, defeating juniors Andie Daniell and Sophie Chang 6-3, 6-3. This week's Pro Circuit events in the United States are a $10,000 Futures in Pittsburgh and the $50,000 Challenger in Winnetka for the men, but there are no women's events. 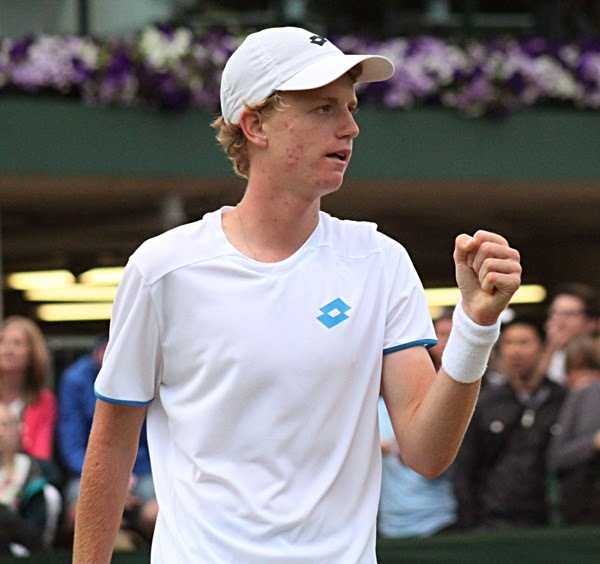 A long day of waiting out the rain proved worthwhile for three US juniors, with Logan Smith and Dasha Ivanova picking up their first junior slam wins, and Alex Rybakov getting his second as the Wimbledon Junior Championships began Saturday. Rain arrived shortly before the scheduled 11:00 a.m. start time, but Rybakov and Ivanova were the first matches scheduled on their courts, so they had to be ready the moment the rain stopped and the covers were removed from the courts. At around 12:30, Rybakov began his match with wild card Rhett Purcell of Great Britain and Ivanova took the court against Qiu Yu Ye of China, but not much was decided before heavy rain disrupted play for three more hours. Purcell was serving at 1-2 and Ivanova was serving at 2-3 and as they waited matches of the other juniors scheduled for later in the day were steadily being cancelled. It was after 6 p.m. when the skies finally cleared and the players returned to the courts, having spent their time hanging out in the separate junior lounge, trying to stay loose. "I don't have a coach with me but I have three of my friends here (Alejandro Tabilo, Tornado Alicia Black and Katrine Steffensen) and they relax me, get me laughing and that's the best," said Ivanova, who trains at L'Academie de Tennis in Boynton Beach, Florida. "I was just listening to music, watching FIFA as well." Ivanova was determined to play aggressively against Ye, ultimately posting a 7-6(4), 4-6, 6-2 victory, and using her experience from last year, when she qualified for the main draw, but fell in the first round. "I learned from last year, everything is just chaos, my mind's all over the place," said the 17-year-old from Portland, Oregon. "I look up and see Centre Court. I knew I had to just focus--that's why I wear the visor, to focus on the court--and not pay attention to what's going on around me. Last year I felt like a little girl out there, in such a big world, with everyone staring down at me." Ivanova admitted that her concentration waned slightly in the second set but she continued to hit out, with her service return particularly effective in the latter stages of the third set. "When I played aggressive she couldn't really keep up," said Ivanova. "That worked the best for me. I pushed a few balls and she would just hit winners, so I knew I had to stay aggressive." While Ivanova was closing out Ye on Court 5, Rybakov was in deep trouble on Court 19. After winning the first set 7-6(5), after saving two set points serving at 3-5, Rybakov dropped the second set 6-3 and trailed 3-1 in the third. But even with a large crowd urging on the British wild card, Rybakov got the break back and earned two match points with Purcell serving at 4-5 15-40. The 18-year-old right-hander saved them both with some good serving, closing out the game with an ace, and soon they reached the advantage portion of a match--new territory for Rybakov. "It's a new feeling," said Rybakov, a 17-year-old from Coral Springs, Florida. "But for me it was pretty regular. I just told myself to hold my serve, try to get into the return games and make him play. I was prepared to go whatever distance it was going to go." Rybakov saved a break point at 7-7 in the third set with a perfectly struck forehand winner that painted the sideline and went on to hold. In the next game, Purcell saved his third match point with a similarly bold forehand winner, but he was unable to keep Rybakov from earning a fourth in a rapid-fire exchange with Purcell at the net. Purcell wasn't able to get his first serve in on that fourth match point, and finally succumbed to the pressure, double faulting to give Rybakov the 7-6(5), 3-6, 9-7 victory. A year ago, Rybakov was winning the ITF Grass Courts in Philadelphia, but acknowledged the differences between that grass and the surface at Wimbledon. "I wasn't really taking that result into mind, because I knew when I came here it was going to be a lot different," Rybakov said. "It's really a unique surface, and these past two weeks, I've really, really enjoyed playing on it, and hopefully, I'll get to play some more." Rybakov's second round opponent is Petros Chrysochos of Cyprus, who upset No. 5 seed Quentin Halys of France 4-6, 6-4, 6-2. While Rybakov finished before the fading light became a factor, Smith was getting worried as his match with Marc Polmans of Australia was drawing to a close. After trailing 5-3 in the opening set, Smith shook off his nerves and dominated the second half of the match, finishing off Polmans 7-5, 6-2 with very little light left. "It's the first grand slam main draw I've ever played," said Smith, 17. "I was a little nervous, but I started to loosen up a little more. I got a lot of confidence after I broke at 5-all, and I knew I had it in my hands there. At 5-2 (in the second), I was like, I've got to finish this, I've got to finish this before they suspend it." "It suits my game," said Smith, who signed dozens of autographs after his match. "I served really well and that was a main factor today. The atmosphere is amazing, something like I've never played before. I love the courts here--Roehampton has some not-so-good bounces--and it's definitely amazing to play here. To play my first grand slam and to win here is really special." Raveena Kingsley was the fourth US junior to take the court on Saturday, but she was not able to complete her match with Simona Heinova of the Czech Republic. Kinglsey lost the first set in a tiebreaker, with the second set at 3-3 when play was suspended until Monday due to darkness. Although only seven junior matches were completed, two seeds lost, both of them boys. In addition to Halys's loss, No. 3 seed Orlando Luz of Brazil was eliminated, with British wild card Joshua Sapwell delighting the legion of British fans with a 4-6, 6-3, 6-0 upset. For complete results, and Monday's order of play, see the Wimbledon website. There is no play on the middle Sunday at Wimbledon, so the other 14 US juniors are scheduled to play on Monday. I've arrived in England to cover the Wimbledon Junior Championships, which will feature nine US boys and nine US girls in the main draw. Two of them--Henrik Wiersholm and Kaitlyn McCarthy--drew the No. 1 seeds. McCarthy will play No. 1 seed Ivana Jorovic of Serbia on Saturday and Wiersholm will play No. 1 seed and French Open boys champion Andrey Rublev of Russia on Monday. Wiersholm took Rublev to three sets in the second round of the French Open earlier this month, losing 6-3, 3-6, 6-3. Rublev won the Roehampton Grade 1 singles title today, defeating No. 6 seed Johan Sebastien Tatlot of France 6-4, 2-6, 6-2. That win extended the 16-year-old's winning streak to 17 straight, including a Futures title back in May. The girls title at Roehampton went to Eddie Herr champion Jelena Ostapenko of Latvia. The unseeded 17-year-old defeated No. 5 seed Kristina Schmiedlova of Slovakia 6-2, 6-3. No. 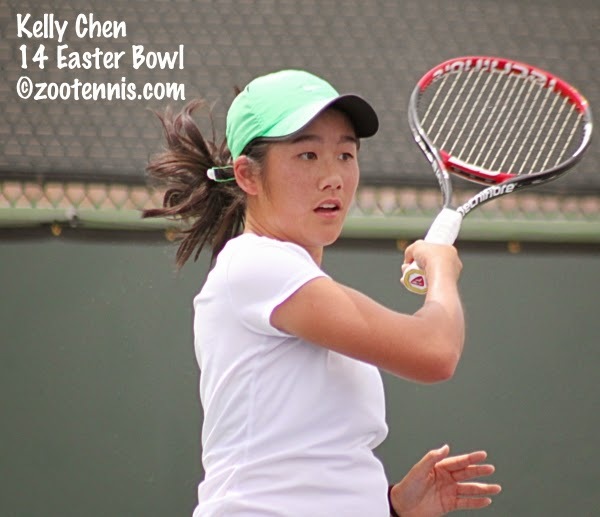 4 seeds Priscilla Hon of Australia and Fanny Stollar of Hungary won the girls doubles title, beating No. 2 seeds Paul Badosa Gibert and Aliona Bolsova Zadoinov of Spain 3-6, 6-3, 10-8. In the boys doubles final between two unseeded teams at Roehampton, Jan Choinski of Germany and Hubert Hurkacz of Poland defeated Tatlot and Corentin Moutet of Franch 6-4, 7-5. Back to the Wimbledon draws, where two surprise entrants appeared in the boys division: 2013 Wimbledon boys finalist Hyeon Chung and Duck Hee Lee, both of Korea. Neither were on the initial acceptance list but both received wild cards. Chung, who is seeded No. 2 due to his ATP ranking of 299, is actually still competing in the Nan Chang Challenger in China, where he has reached the quarterfinals, with the semifinals also scheduled for Saturday. Lee, the No. 10 seed at Wimbledon, was playing a Futures in Korea this week, but lost in the second round. Needless to say, neither will have much of an opportunity to adjust to a vastly different time zone and surface. Those two late additions may have bumped qualifier Noah Rubin out of the seedings, but my calculations show he still should have been seeded based on his ATP ranking of 539. I will have to clarify what miscalculation I made, but Rubin is not seeded, and will play British wild card Jamie Malik in a Monday match. Michaela Gordon also came through qualifying, and as with all qualifiers, will have two days off, opening their tournament on Monday. All told, there are 15 boys singles matches and 13 girls singles matches on tap for Saturday. In addition to McCarthy, two other US girls will be in action--Dasha Ivanova, who plays Qiu Yu Ye of China, and Raveena Kingsley, who faces Simona Heinova of the Czech Republic. No. 2 seed CiCi Bellis, No. 3 seed Tornado Alicia Black, Katrine Steffensen, Sofia Kenin and Usue Arconada are Americans projected to play their first round matches on Monday. Three US boys will take the courts Saturday, with Logan Smith playing Marc Polmans of Australia, Alex Rybakov taking on wild card Rhett Purcell of Great Britain and No. 7 seed Francis Tiafoe meeting Martin Blasko of Slovakia. In addition to Rubin and Wiersholm, four other US boys will start their tournament on Monday--Stefan Kozlov(6), Michael Mmoh(11), Dennis Uspensky and Roehampton semifinalist Taylor Fritz. 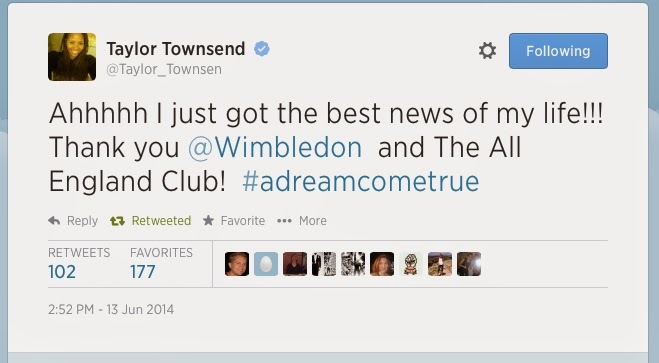 For the complete draws, see the Wimbledon website. 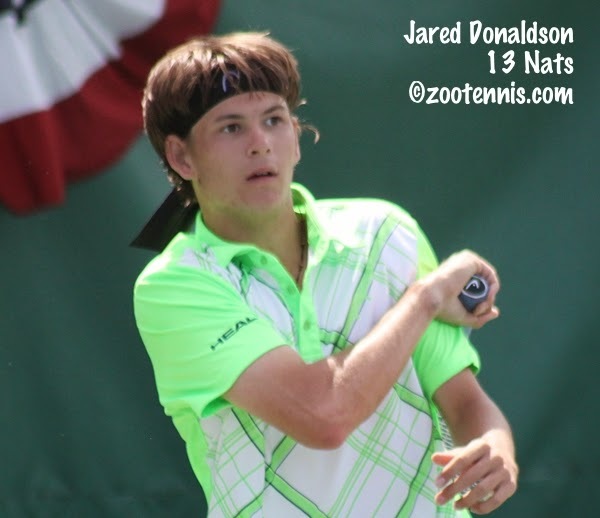 Back in the United States, Jared Donaldson stayed undefeated in Futures events this month, defeating Collin Altamirano 6-2, 6-1 to reach the semifinals of the $15,000 Oklahoma City Futures and avenging his loss in the 2013 Kalamazoo final. Donaldson is now 13-0 in Futures play in June. He will play Raymond Sarmiento(USC) in the semifinals Saturday. 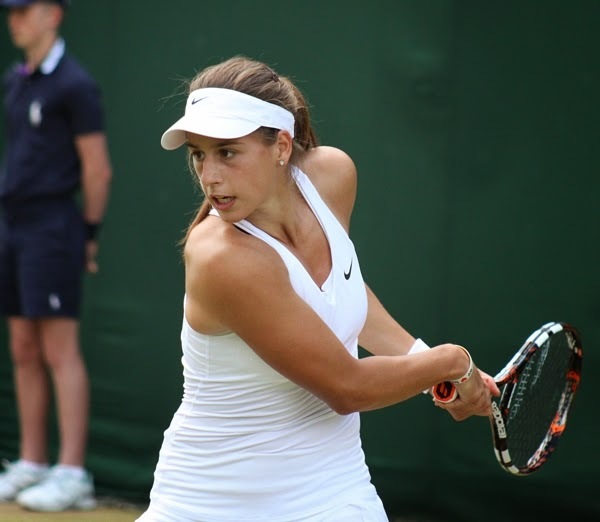 CiCi Bellis and Taylor Fritz lost today in the semifinals at the ITF Grade 1 in Roehampton, the warmup tournament for the Wimbledon Junior Championships, which begin on Saturday. Bellis, the top seed, fell to No. 5 seed Kristina Schmiedlova of Slovakia 6-4, 6-2, while the unseeded Fritz was beaten by top seed Andrey Rublev of Russia 6-4, 3-6, 6-2. Schmiedlova will meet unseeded Jelena Ostapenko of Latvia in Friday's final, with Rublev's opponent No. 6 seed Johan Sebastien Tatlot of France. For complete draws see the LTA website's home page. 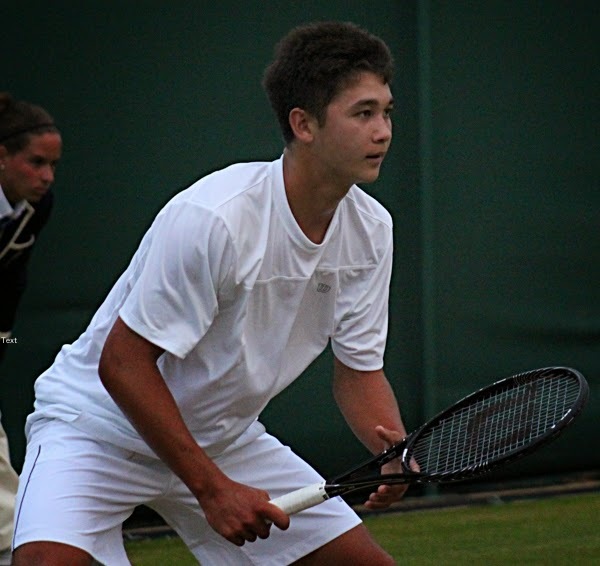 The first round of qualifying for the Wimbledon Junior Championships was completed at Roehampton today, with Noah Rubin and Michaela Gordon advanced to the the second and final qualifying round. Rubin, the top seed, beat Mateusz Terczynski of Poland 6-2, 6-3 and No. 5 seed Gordon, playing her first match on grass this season, defeated Morgane Michiels of Belgium 6-1, 6-2. No 11 seed Raquel Pedraza, the other US player in qualifying, lost to Mirabelle Njoze of Great Britain 6-2, 6-4. The draws and Friday's order of play can also be found at the LTA website. John Isner is the last US man standing in the men's singles draw at Wimbledon, with Jack Sock, Sam Querrey and Denis Kudla all losing their second round matches today. The news for the US women was much better, with Madison Keys, Serena Williams and Alison Riske joining Lauren Davis and Venus Williams in the round of 32. Vicky Duval's second round match with 2013 ITF junior champion Belinda Bencic of Switzerland had to be rescheduled for Friday due to evening rain at Wimbledon. Nineteen-year-old Australian Nick Kyrgios, the only teenager in the ATP Top 200, saved nine match points today to defeat No. 13 seed Richard Gasquet of France 10-8 in the fifth set and will play another former ITF world No. 1 junior, Jiri Vesely of the Czech Republic in the third round. Complete draws can be found at the Wimbledon website. 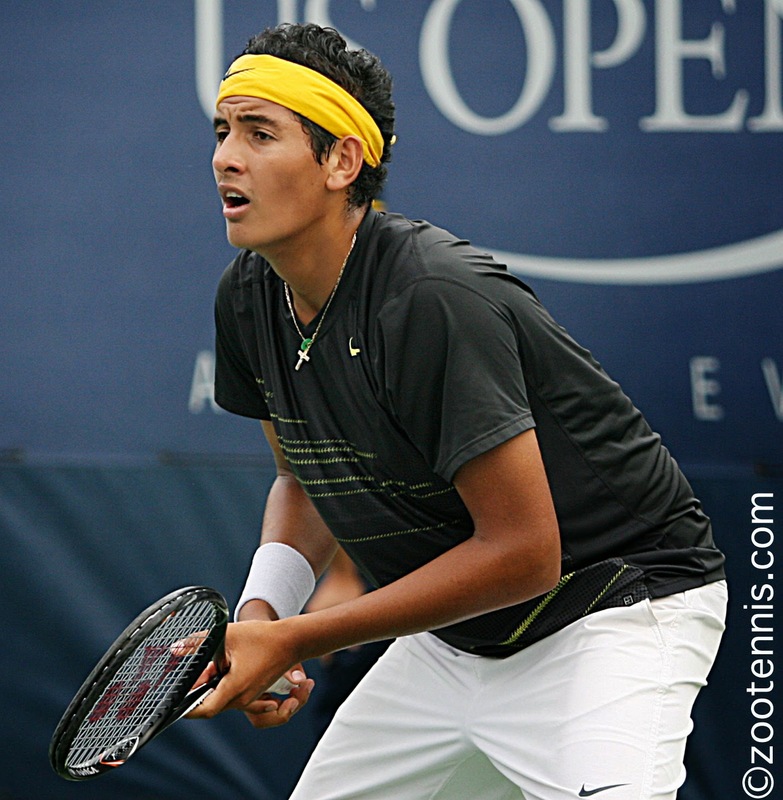 Lisa Stone at the Parenting Aces blog has posted the names of the wild cards for the USTA Clay Courts next month. I would be willing to bet that all eight wild cards WILL be used for the Kalamazoo 18s this year. Two players who will need them--last year's finalist Jared Donaldson and winner Collin Altamirano--will meet again tomorrow in the quarterfinals of the $15,000 Futures in Oklahoma City. 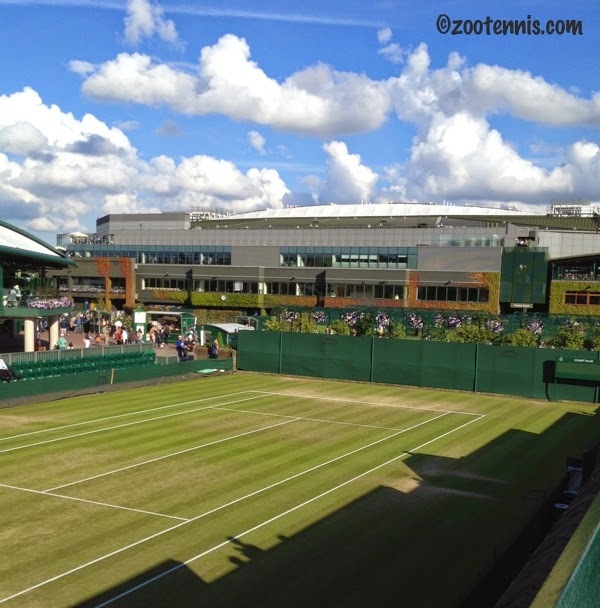 There's plenty of news today, both in college tennis and on the grass courts of Wimbledon and Roehampton. Another big college job opened today with the announcement that University of Texas women's head coach Patty Fendick-McCain is retiring after nine years in Austin. A two-time NCAA singles champion at Stanford in 1986 and 1987, Fendick-McCain also won an Australian Open doubles title with Mary Joe Fernandez and was ranked in the WTA Top 20. Given the size and the athletic department budget of Texas, this ranks as the most significant coaching change on the women's side this year. The Wimbledon junior qualifying begins Thursday at Roehampton, with just three US players participating. Top qualifying seed Noah Rubin is the only US boy, and if he gets through his two qualifying matches, he will be seeded in the main draw thanks to his ATP ranking of 539. Both Taylor Fritz and Dennis Uspensky, who were next in the main draw, must have gotten in, as neither are in qualifying. Fritz may have gotten in on a special exemption, since he reached Thursday's semifinals at Roehampton, but I'm sure the method of reaching the main draw isn't important, as long as he's in. The US girls in qualifying are Raquel Pedraza and Michaela Gordon. Pedraza has been in Europe for some time, but the 14-year-old Gordon, if you recall, won the Northern California US Open Playoffs over the weekend, so she hasn't had much time to acclimate herself to the grass. She is the No. 5 seed in qualifying, with Pedraza the No. 11 seed. Olivia Hauger was third out of the main draw, and with Katie Swan from Great Britain most likely getting a wild card, she may have avoided qualifying, as she is not in the girls draw. The Wimbledon junior draws and the order of play for Thursday are available at the LTA website. At the Roehampton Grade 1, CiCi Bellis and, as mentioned, Taylor Fritz have reached the singles semifinals. The unseeded Fritz defeated Seong Chan Hong of Korea 7-6(5), 6-4 and will meet top seed Andrey Rublev of Russia in the semifinals. Bellis, the top girls seed, reached the semifinals with a 4-6, 6-2, 6-4 victory over No. 12 seed Katie Boulter of Great Britain. Bellis will play No. 5 seed Kristina Schmiedlova of Slovakia in Thursday's semifinals. The Roehampton draws and order of play are also available at the LTA home page. At Wimbledon, Venus Williams and Lauren Davis collected second round wins, and Sam Querrey is 9-9 in the fifth set with No. 14 seed Jo-Wilfried Tsonga of France. In addition to the completion of the Querrey-Tsonga match, Serena Williams, Alison Riske, Madison Keys, Jack Sock, Denis Kudla, John Isner and Vicky Duval are on Thursday's singles schedule. A new tournament spotlighting American collegiate players will be introduced this year at the US Open, and I had the opportunity to write about it for the Tennis Recruiting Network after speaking with Tournament Director Bill Mountford, as well as chairman, president and CEO of the USTA Dave Haggerty. The tournament will certainly raise the visibility of American collegiate players, who, except for the NCAA champions, aren't much in evidence at the US Open. JOHN ISNER: Yeah, I mean, I am not ‑‑ I kind of went against the grain there going to college for four years and making the top 10. You probably won't see that that often. In other college news, Martin Redlicki, who originally signed an National Letter of Intent to attend Duke before his brother Michael was suspended from the team this spring, has been released from his commitment to Duke and will play for the UCLA Bruins this fall. On the women's side at Wimbledon, both Alison Riske and Vicky Duval defeated seeds in Tuesday's first round, with Riske downing No. 26 seed Anastasia Pavlyuchenkova of Russia 4-6, 7-5. 6-1 and Duval eliminating No. 29 seed Sorana Cirstea of Romania 6-4, 3-6, 6-1. Eastbourne champion Madison Keys defeated Monica Puig of Puerto Rico 6-3, 6-3, her first win over Puig in three attempts, and Serena Williams and Varvara Lepchenko joined Monday first-round winners Lauren Davis, CoCo Vandeweghe and Venus Williams(30) in the second round. Wild card Taylor Townsend, who did not play a grass warmup tournament, lost to No. 31 seed Klara Koukalova of the Czech Republic 7-5, 6-2. 2013 NCAA champion from Ohio State Blaz Rola of Slovenia plays defending champion Andy Murray on Court 1 on Wednesday. For complete draws, see the Wimbledon website. 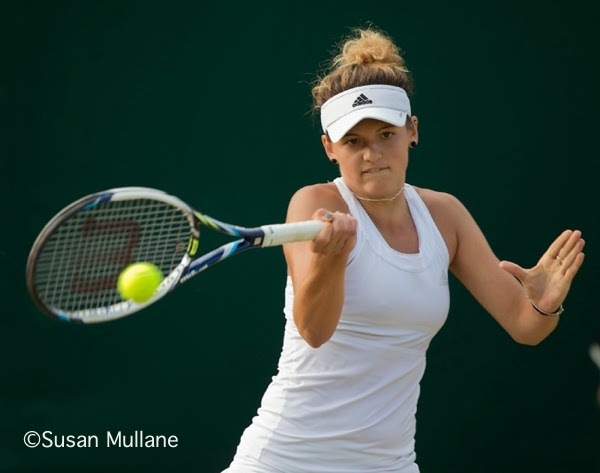 At the Grade 1 ITF junior tournament in Roehampton, two US players have made it to the quarterfinals--top seed CiCi Bellis and unseeded Taylor Fritz. Bellis beat No. 13 seed Renata Zarazua of Mexico 6-2, 6-2, while Fritz picked up his best career result in ITF junior play, defeating world No. 4 and Roehampton No. 3 seed Jaume Munar of Spain 4-6, 7-5, 6-4. Fritz and Logan Smith also advanced to the doubles quarterfinals, the only US team to do so. The draws and Wednesday's order of play can be found at the LTA website. Ben Rothenburg of the New York Times published an informative article on how the lucky loser designation is arrived at--which is different depending on whether the qualifier lost in a standard WTA or ATP event and a slam--and why that policy was instituted. As it applies to the USTA summer gold ball nationals, which have qualifying the first time this year, the procedure requires using the ATP/WTA highest ranking procedure, not the ITF Grand Slam lottery. And for those who have had a gut feeling that Christina McHale is getting easy draws and Ryan Harrison difficult draws in majors, Carl Bialik, writing for the Fivethirtyeight blog, confirms those suspicions with some actual data. An early post today, ahead of a long day of travel for me. After a few vacation days in Germany, I'll move on to London to start onsite coverage of the Wimbledon Junior Championships, which begin on Saturday, June 28th. I'm not sure what my access to internet will be the next several days, but I will try to post if I can, primarily about what's going on with the Americans at Wimbledon and with the US juniors at Roehampton. There are two Futures events again this week for the men--one a $10,000 in Rochester, NY and one a $15,000 in Oklahoma City--and a $10,000 Pro Circuit tournament in Charlotte, NC for the women. The Sectional Qualifying for the US Open National Playoffs are wrapping up this month, and here are the results since my previous update. The Midwest and Middle States tournaments are nearing completion, with Texas, Southern and Missouri Valley finishing by the end of the week. A more biography of the recent winners can be found at this page on usta.com. Links to the individual TennisLink sites and the full list of winners can be found in the results section on that same page. Seventeen-year-old Jared Donaldson and 16-year-old Katerina Stewart gave the United States two winners on Sunday in Tulsa, Oklahoma and Bethany Beach, Delaware. Seventh seed Donaldson, who won a $10,000 Futures in Turkey earlier this month, defeated top seed and 2013 NCAA finalist Jarmere Jenkins 4-6, 6-3, 7-5 in the $15,000 Tulsa Futures final, after trailing 3-0 in the third set. 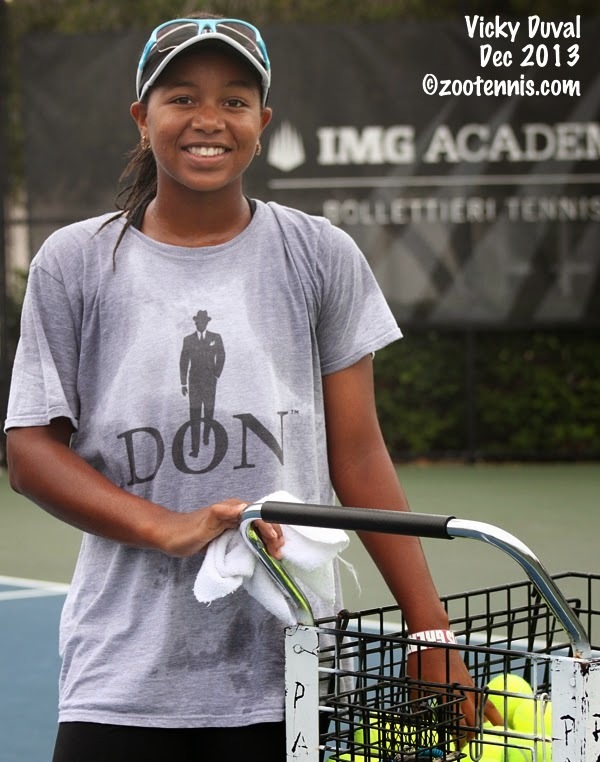 Donaldson, a finalist in the Kalamazoo 18s last year, has now won ten straight Futures matches on two continents, on both clay and hard courts. Stewart, also a No. 7 seed, did not lose a set in her five wins at the $10,000 tournament in Bethany Beach, and conceded only four games total in her semifinal and final wins. Stewart, who won the $10,000 Pro Circuit event in Orlando in March, defeated unseeded Jose Kuhlman 6-0, 6-3 in today's final. At the Buffalo $10,000 men's Futures, No. 2 seed Ashley Hewitt of Great Britain came back to defeat No. 3 seed Henrique Cunha of Brazil 3-6, 6-2, 6-3 to take the title. 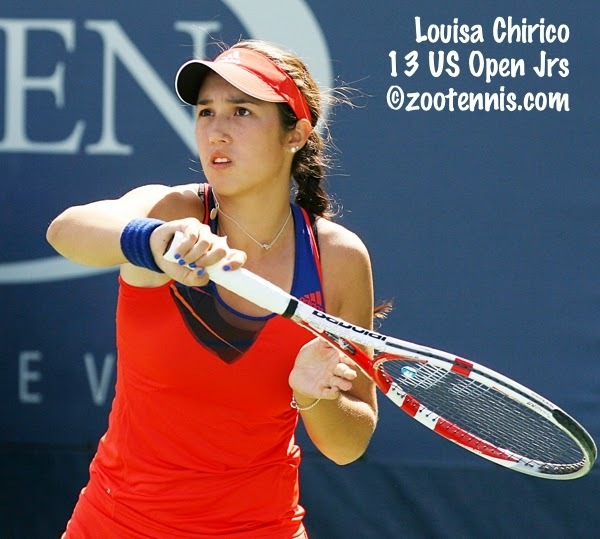 Louisa Chirico fell short in her attempt at a second consecutive $25,000 ITF Women's Circuit title, losing to Australian Open champion Elizaveta Kulichkova of Russia 7-5, 6-2 in today's final in Switzerland. The first round of play at the ITF Grade 1 Nike International in Roehampton was not a particularly good one for the US juniors warming up for Wimbledon, with the boys going 3-4 and the girls 5-4. Two seeded US players, No. 8 Michael Mmoh and No. 14 Sofia Kenin lost, Mmoh to Marc Polmans of Australia 6-4, 6-1 and Kenin to Eddie Herr champion Jelena Ostapenko of Latvia 6-3, 6-3. No. 4 seed Stefan Kozlov defeated Jordi Arconada 6-1, 6-3 and No. 5 seed Francis Tiafoe squeezed by Joao Menezes of Brazil 4-6, 6-1, 7-6(3). Taylor Fritz was the third US boy to advance to the second round. Alex Rybakov, Logan Smith and Henrik Wiersholm lost their openers. Top seed CiCi Bellis and No. 2 seed Tornado Alicia Black advanced in straight sets, and qualifier Raquel Pedraza also reached the second round. Kaitlyn McCarthy trailed Easter Bowl finalist Katie Swan 5-2 in the third set, with Swan serving for the match, but won the final five games to earn a 6-3, 2-6, 7-5 victory. McCarthy had beaten Swan 6-2, 6-1 at the Carson ISC Grade 1 back in April. Usue Arconada, the No. 16 seed, won a thriller, beating Tami Grende of Indonesia 3-6, 6-2, 7-6(12). In addition to Kenin, Katrine Steffensen, Dasha Ivanova and Raveena Kingsley lost their first round matches today. A total of five boys seeds lost, including No. 2 seed Orlando Luz of Brazil, who was beaten by Lucas Miedler of Austria 6-2, 7-6(5). No. 3 girls seed Aliona Bolsova Zadoinov of Spain was one of only two girls seeds to fall, beaten by 15-year-old Canadian qualifier Katherine Sebov 6-2, 6-0. Because I am leaving for Europe on Monday, and spending a few days in Germany visiting friends before flying to London to cover the Wimbledon Junior Championships, I won't be following the Roehampton tournament (or the first week of Wimbledon, for that matter) as closely as I usually do. But the draws can be found at the LTA home page, and there is live scoring available at this site. The order of play for Monday's start at Wimbledon can be found here. Twelve of the 23 Americans are scheduled to play Monday: Ryan Harrison, Venus Williams, Sloane Stephens, Alex Kuznetsov, Bradley Klahn (v) Sam Querrey, Vania King, Steve Johnson, Donald Young, Lauren Davis, CoCo Vandeweghe and Varvara Lepchenko. Although the US ITF Junior Circuit does have a Grass Court tournament, held earlier this month in Philadelphia, it's a Grade 4, meaning the only two major grass tournaments for the 18-and-under set are the next two weeks in London with the Roehampton Grade 1 (now sponsored by Nike) and the Wimbledon Junior Championships. I will not be at the former, just the latter, but most of the same players will be at a both, including world No. 1 junior Andrey Rublev of Russia. Rublev, who won the French Open boys title earlier this month, is, of course, the top seed in both events. Serbia's Ivana Jorovic, who took over the No. 1 spot after reaching the French Open girls final, will be the top seed at Wimbledon, but she is not playing Roehampton, which leaves second-ranked CiCi Bellis as the top seed. Bellis is one of four US girls seeded, with Tornado Alicia Black No. 2, Sofia Kenin No. 14 and Usue Arconada No. 16. The other five US girls in the 64-player draw are Katrine Steffensen, Raveena Kingsley, Dasha Ivanova, Kaitlyn McCarthy and Raquel Pedraza, who qualified. Three of the seven US boys in the draw are seeded: No. 4 Stefan Kozlov, No. 5 Francis Tiafoe and No. 8 Michael Mmoh. The other four are Alex Rybakov, who will play Rublev in the second round if they both win, Taylor Fritz, Henrik Wiersholm and Logan Smith. 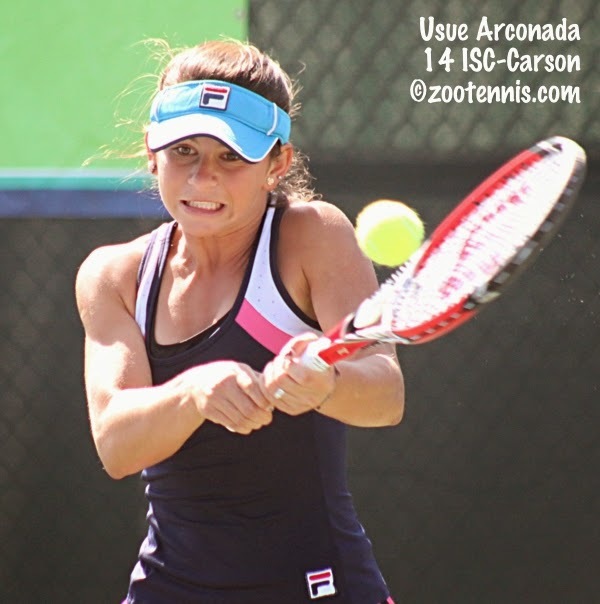 Argentina's Jordi Arconada, who trains at the Junior Tennis Champions Center in College Park, Md., qualified and will face Kozlov in the first round. For the draws and Sunday's order of play, see the LTA home page. For an interesting look back at the past 13 years of Wimbledon junior champions, see this AFP article. (My response to the headline is well, duh, but it's worth reading). The US juniors are dreaming of having a week on grass the two slightly older Americans had last week, with qualifier CoCo Vandweghe and unseeded Madison Keys both picking up their first WTA titles with victories today. The 19-year-old Keys became the youngest woman to win a Premier WTA title since Caroline Wozniacki in 2009 when she defeated No. 5 seed Angelique Kerber of Germany 6-3, 3-6, 7-5 in the final at Eastbourne, England. Vandeweghe, 22, defeated Zheng Jie of China 6-2 6-4 in the final of the WTA International-level event in 'S-Hertogenbosch, Netherlands, and her serve was the star throughout the tournament. According to this WTA article about the final, Vandweghe won 27 of 28 first serve points and never faced a break point in the championship match. She hit a total of 81 aces in her seven matches. At the Tulsa $15,000 Futures, 17-year-old Jared Donaldson will play top seed Jarmere Jenkins(Virginia) in Sunday's final. Jenkins defeated unseeded 17-year-old Ernesto Escobedo 6-3, 6-1 in today's semifinal, while Donaldson, the No. 7 seed, beat unseeded Mackenzie McDonald(UCLA) 6-3, 7-6(1). Donaldson won a Futures title earlier this month in Turkey on clay, but this is his first hard court final. Donaldson, who has now won nine straight Futures matches, has reached at least the quarterfinals of his last eight Futures played in 2014. Eighteen-year-old Louisa Chirico is also on a streak. Last week Chirico won the $25,000 ITF Women's Circuit event in Italy, her first at that prize-money level and she has continued that form, reaching the final of the $25,000 tournament in Switzerland, also on clay. The unseeded New Yorker will take on reigning Australian Open girls champion, 18-year-old fifth seed Elizaveta Kulichkova of Russia, in the final. Chirico has a title in hand already, however, as she and Sanaz Marand(North Carolina) won the doubles title. The No. 2 seeds defeated No. 3 seeds Su Jeong Jang of Korea and Justyna Jegiolka of Poland 6-3, 6-4. At the Bethany Beach $10,000 women's Pro Circuit event, Katerina Stewart aims for her second title at that level when she takes on Jose Kuhlman in the final. No. 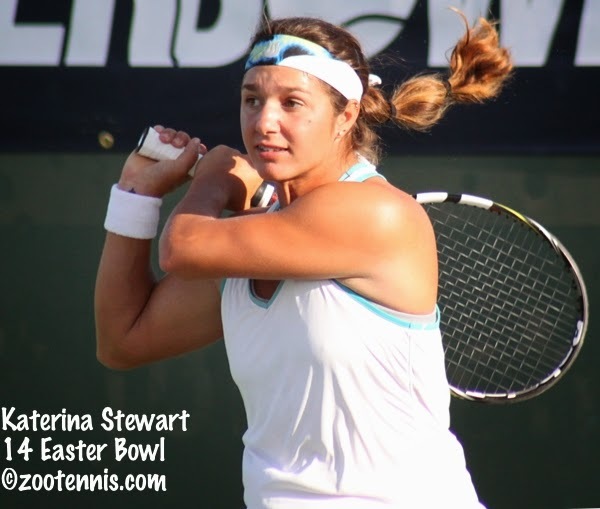 7 seed Stewart, who won the Orlando $10K in March, breezed past No. 6 seed Peggy Porter 6-0, 6-1, while Kuhlman, into her first final, defeated wild card Ingrid Neel 6-3, 6-1. Top seeds Alexandra Mueller and Lena Litvak(Harvard) won the doubles title, beating Stewart and Rima Asatrian 6-4, 6-1 in the final. At the Buffalo $10,000 Futures, former Duke star Henrique Cunha of Brazil, the No. 3 seed, will face No. 2 seed Ashley Hewitt of Great Britain in the final. Cunha beat wild card Nathan Pasha(Georgia) 6-7(5), 6-3, 6-0 in today's semifinals, with Hewitt downing No. 8 seed Daniel Nguyen(8) 7-6(12), 7-6(3). Connor Smith(Ohio State) and Jean-Yves Aubone(Florida State) won the doubles title, with the No. 2 seeds beating top seeds Luke Bambridge and Liam Broady of Great Britain 6-3, 2-6, 10-6. The Wimbledon draws for singles and doubles were released this morning, with 10 US men and 13 US women learning who they will play on the opening two days of competition next week. The complete draws can be found at the Wimbledon website, with the doubles draws also posted. The ITA has posted their update on former college players at Wimbledon, and that can be found here. Both CoCo Vandweghe and Madison Keys have had great weeks warming up for Wimbledon. Vandeweghe, who beat her Wimbledon opponent yesterday in the WTA tournament in the Netherlands, reached the finals with a 6-4, 6-2 win today over No. 8 seed Klara Koukalova of the Czech Republic, who will be Townsend's Wimbledon opponent. Vandeweghe plays Zheng Jie of China in Saturday's final, the second WTA final of Vandeweghe's career. The 19-year-old Keys, playing at the WTA event in England, reached her first WTA final, defeating Great Britain's Heather Watson 6-3, 6-1 in the semifinals today. Keys will play Angelique Kerber of Germany in the final. Both Vandeweghe and Keys are tall, but this article in the New York Times offers a counter to the conventional wisdom that height is now a necessary requirement for tennis success. I've read Moneyball: The Art of Winning an Unfair Game , so I don't need convincing there is a place at the highest reaches of tennis for any size player, but I often do hear others insist that height matters. At the USTA Pro Circuit events in Bethany Beach, Delaware and Tulsa, Oklahoma, seven of the eight semifinalists are American teenagers. 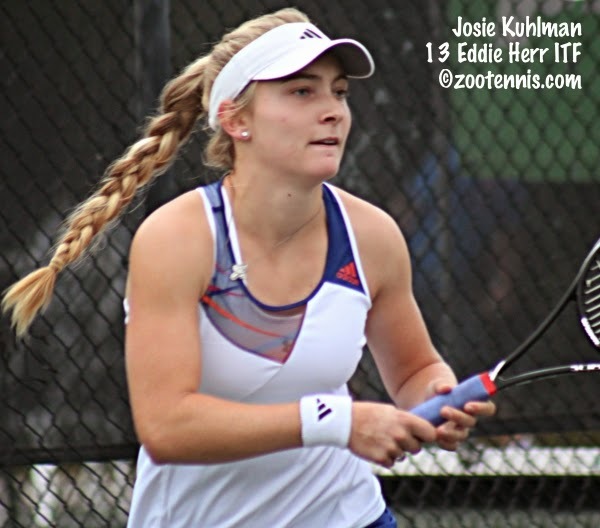 At the women's $10,000 event in Delaware, 18-year-old Jose Kuhlman, a Florida recruit, will take on wild card Ingrid Neel, the 16-year-old who just won the ITF Grade 4 Grass Courts title, in one semifinal. The other semifinal will feature 16-year-old Katerina Stewart, the No. 7 seed, against 18-year-old Florida recruit Peggy Porter, the No. 6 seed. Kuhlman defeated top seed Alexandra Mueller in the first round and hasn't lost a set yet, but neither have the other three teens. At the $15,000 men's Futures in Tulsa, 19-year-old Mackenzie McDonald(UCLA) will face 17-year-old Jared Donaldson(7) in one semifinal, after McDonald defeated No 2 seed Dimitar Kutrovsky(Texas) and Donaldson downed No. 3 seed Sanam Singh(Virginia) in the quarterfinals today. Seventeen-year-old Ernesto Escobedo defeated Raymond Sarmiento(USC) to set up a meeting with the only non-teen left, top seed Jarmere Jenkins(Virginia). Dennis Novikov(UCLA) and Eric Quigley(Kentucky) won the doubles title in Tulsa, with the top seeds defeating Donaldson and Farris Gosea(Illinois) 7-6(5), 6-3 in the final. At the $10,000 Futures in Buffalo New York, no teens remain, but three of the four semifinalists have college ties. Unseeded wild card Nathan Pasha, a rising senior at Georgia, will play No. 3 seed Henrique Cunha, the former All-American at Duke in one semifinal. No. 8 seed Daniel Nguyen(USC) will play No. 2 seed Ashley Hewitt of Great Britain in the other semifinal. One of the best parts about covering college tennis is the opportunity it gives me to talk, both informally and formally, with the top coaches. During last month's NCAA championships in Athens, I spoke with three of the best--Stanford's Lele Forood, Georgia's Manny Diaz and Southern California's Peter Smith--about the role college tennis can play in the development of professional tennis players. All three have recently had players go from college into the Top 100 of the professional ranks and I asked them about the pros and cons of developing in a college atmosphere. 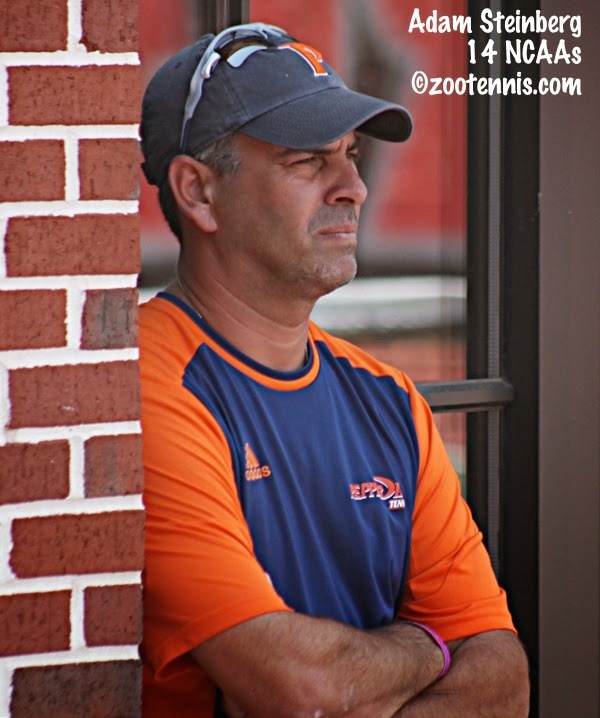 Their answers are in this article, posted today at the Tennis Recruiting Network. Thursday's final round of qualifying at Wimbledon went well for the US men and badly for the US women. Three American men--Denis Kudla, Ryan Harrison and Alex Kuznetsov--advanced to the main draw, but only one woman of the six in action made it--Vicky Duval. No. 15 seed Duval will be making her Wimbledon debut after defeating two-time NCAA champion Nicole Gibbs 6-4, 4-6, 6-3. Both players struggled with back injuries during the match. Irina Falconi, Shelby Rogers and Madison Brengle all lost three-setters, while Melanie Oudin fell to No. 23 seed Aleksandra Wozniak of Canada 6-4, 6-3. Two recent girls Orange Bowl champions will be in the women's main draw for the first time next week, with 2011 champion Anett Kontaveit of Estonia and 2012 champion Ana Konjuh of Croatia getting through qualifying unseeded. The 18-year-old Kontaveit defeated 2011 Wimbledon girls champion Ashleigh Barty of Australia 6-7(5), 6-3, 6-4, while the 16-year-old Konjuh defeated Stephanie Vogt of Liechtenstein 7-5, 6-3. No. 26 seed Kuznetsov defeated No. 3 seed Tim Smyczek 4-6, 6-3, 6-3, 6-3 to qualify for the second consecutive year, with No. 9 seed Kudla also earning main draw status for the second straight year, 6-3, 5-7, 6-1, 6-4 over Aljaz Bedene of Slovenia. Harrison, the No. 22 seed, was in a difficult section of the draw, but he came through Thursday 7-6(3), 6-2, 6-3 over Daniel Brands. Ben Rothenburg of the New York Times is reporting that Harrison is now being coached by Jan-Michael Gambill. Wimbledon's 2011 boys champion Luke Saville won the day's Iron Man award, with the 20-year-old Australian beating Yann Marti of Switzerland 2-6, 6-3, 5-7, 7-6(7) 8-6. Saville is one of three Australians to advance, along with James Duckworth and Sam Groth. Only one German man made it into the main draw, and probably not one that was expected, with four seeded players from that country going out, while unseeded Tim Puetz survived. 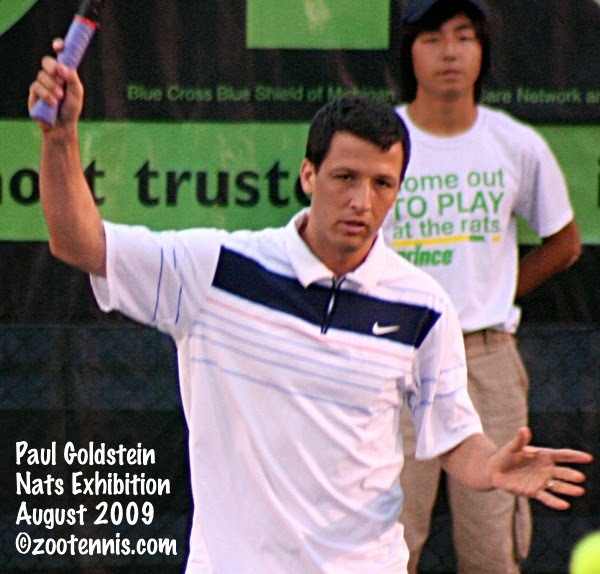 Puetz, an All-American from Auburn who reached the 2010 NCAA semifinals, outlasted 2010 Wimbledon boys champion Marton Fucsovics of Hungary 7-6(3), 7-6(16), 6-1. It will be Puetz's first main draw appearance at a slam. The singles draws will be out at 10 a.m. London time on Friday. See the Wimbledon website for the complete qualifying draws and articles on several of the day's winners. Madison Keys defeated Lauren Davis 6-2, 6-1 to reach the semifinals at the WTA event in Eastbourne against Heather Watson of Great Britain. Read more about Keys and her affinity for grass in this article from livetennis.com. CoCo Vandeweghe reached the semifinals of the WTA 'S-Hertogenbosch Netherlands tournament with an impressive 7-6(3), 6-1 win over Garbine Muguruza of Spain. In the ATP event in the Netherlands, Benjamin Becker, the 2004 NCAA champion from Baylor, also reached the semifinals, defeating No. 6 seed Vasek Pospisil of Canada 6-7(3), 7-6(5), 6-4 in the quarterfinals today. Becker was the subject of this Biofile at on the ATP site, and he gives perhaps a surprising answer when asked to name his greatest sports moment. The grass courts of Roehampton have proven hospitable to US players attempting to qualify for Wimbledon, with five US men and six US men reaching Thursday's final round of qualifying. The men had the day off from singles, with the US women suffering only one defeat, one that was preordained when Shelby Rogers and Grace Min(22) advanced to the second round. It was Rogers who came through, beating Min 6-3, 6-3, joining Nicole Gibbs, Vicky Duval(15), Irina Falconi, Melanie Oudin and Madison Brengle in earning straight-set wins. Gibbs and Duval will play each other in the final round of qualifying, with Gibbs having won their previous meeting at the 2012 Vancouver Challenger 7-5, 7-6(4). Duval may not be 100 percent however, according to the article on the Wimbledon website about her 6-2, 6-2 win today over Misa Eguchi of Japan. Duval received treatment for a back injury and according to the article was in visible pain in the second set. 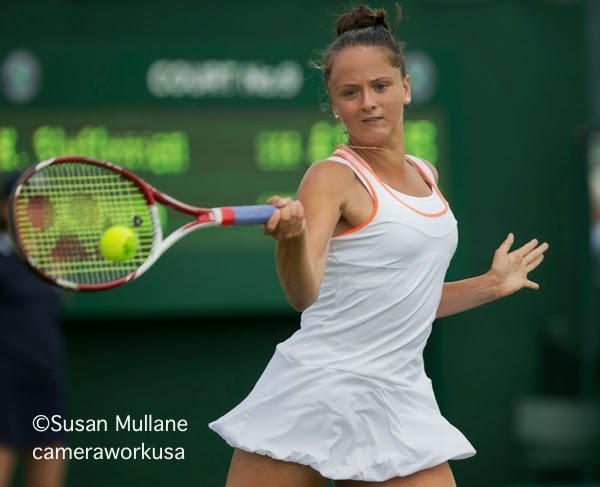 Another interesting match on grass between two young Americans has Lauren Davis meeting Madison Keys in the quarterfinals of the WTA tournament in Eastbourne. The last time the two met, at the Sony in 2013, Davis beat her Evert Academy training partner 6-1, 5-7, 7-6(7). 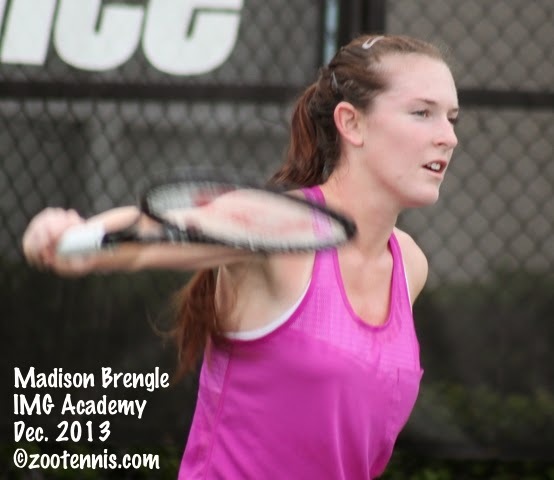 Back at Roehampton, Brengle will be attempting to reach her first main draw in a slam via qualifying, with that quest proving to be a frustrating hurdle for her. According to Jonathan Kelley (who has a new blog on American tennis called On the Rise), Brengle is 0-3 in the final round of qualifying for majors and is 0-26 in overall attempts. Kevin King, the former Georgia Tech All-American, will be playing in the main draw of his first major next week, after he and Ryan Harrison qualified in men's doubles at Wimbledon by defeating Konstantin Kravchuk of Russia and Germany's Tim Puetz, the No. 8 seeds, 6-3, 7-5 today. While the "seniors" are in the final stage of determining the fields at Wimbledon, the juniors will begin their qualifying for their tournament at Roehampton, which starts Thursday. The qualifying for the Grade 1 is at Surbiton, with the main draw moving over to Roehampton on Sunday. The only US player in Roehampton qualifying idraw s Raquel Pedraza, who is the No. 3 seed; Argentina's Jordi Arconada, who lives and trains in the US and just played in the CitiOpen pre-qualifying tournament final on Tuesday, is also in Roehampton qualifying. Links to the order of play and draws can be found on the LTA website on the bottom right of the home page. The ITA announced its Players of the Year today, and there were no surprises, with top-ranked Marcos Giron of UCLA and Jamie Loeb of North Carolina receiving the awards. NCAA doubles champions Hunter Reese and Mikelis Libietis of Tennessee and Erin Routliffe and Maya Jansen of Alabama were named the doubles teams of the year. They will be honored next month during the International Hall of Fame enshrinement weekend in Newport, Rhode Island. The ITA's release can be found here. Tuesday was another good day for Americans at Wimbledon, with five US men winning to reach Thursday's final round of qualifying and seven US women winning their first round matches. One American qualifier is certain, with No. 3 seed Tim Smyczek and No. 26 seed Alex Kuznetsov playing each other. Denis Kudla(9) will play No. 18 seed Aljaz Bedene of Slovenia (although he is switching nationalities to Great Britain soon), Ryan Harrison(22) plays No. 16 seed Daniel Brands of Germany and No. 31 seed Rajeev Ram play meets unseeded Jan Hernych of the Czech Republic. 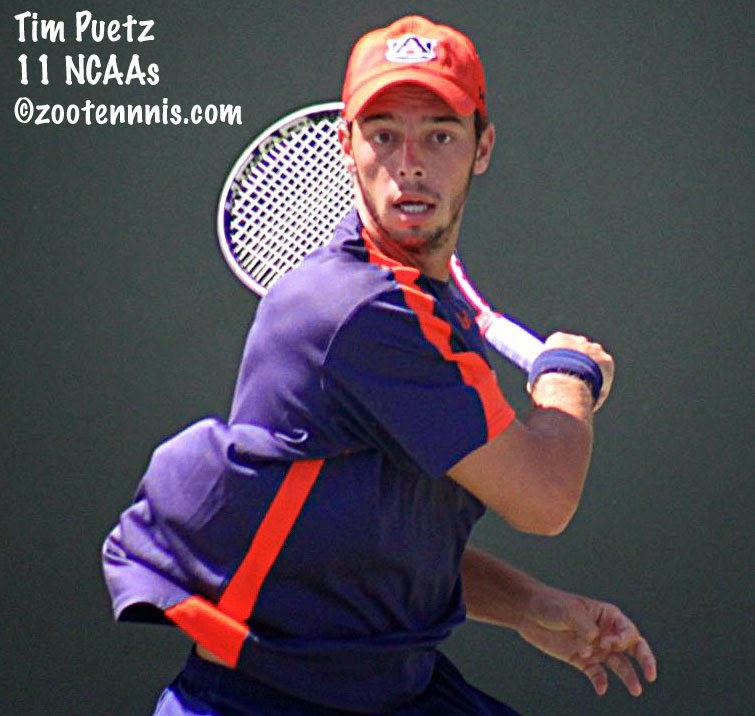 Former Auburn All-American Tim Puetz of Germany also advanced to the final round of qualifying, and he will face 2010 boys champion Marton Fucsovics of Hungary, who is also unseeded. Australian Luke Saville, the 2011 boys champion and 2012 finalist, also needs to win just one more match to make his main draw Wimbledon debut. The US women winning their opening matches today are: Madison Brengle, Melanie Oudin, Shelby Rogers, Nicole Gibbs, Grace Min(22) and Vicky Duval(15). Allie Kiick, beaten by Mayo Hibi, and Sachia Vickery were the only two American women to suffer losses today. Min and Rogers play each other Wednesday. Other notable winners include Australian and US Open girls champion Ana Konjuh of Croatia, back from elbow surgery, and wild card Gabby Taylor, a 16-year-old wild card with no WTA ranking, who reached the Junior Orange Bowl 14s final back in 2012. For more qualifying news, see the Wimbledon website. Wednesday's schedule is here. Qualifying draws are here. The Junior Tennis Champions Center in College Park, Md., staged a tournament to decide qualifying wild cards for next month's CitiOpen, the combined ATP/WTA event in Washington DC. All four finalists trained at the JTCC, with top seed Francis Tiafoe, 16, defeating unseeded Jordi Arconada, 17, 6-1, 7-6(3) in the men's final and Jordi's sister Usue, 15, downing former UCLA Bruin and No. 4 seed Skylar Morton 7-6(4), 7-5. Arconada, the No. 2 seed, has already won a qualifying match at the CitiOpen, defeating Argentina's Maria Irigoyen 7-5, 6-3 in the opening round last year. For more on the match, see the JTCC blog. For links to the complete draws, see the CitiOpen website. After no Pro Circuit tournaments at all in the US last week, there are three this week, two men's Futures and the $10,000 women's event in Bethany Beach, Delaware. Although qualifying was just completed today, with 14-year-old Nada Dimovska 15-year-old Maria Shishkina, 16-year-old Erica Oosterhout, 16-year-old Caroline Lampl and 17-year-old Alexandra Valenstein among those reaching the main draw, there has already been a major upset, with Florida recruit Josie Kuhlman defeating top seed Alexandra Mueller 6-0, 6-3 in the first round. Andie Daniell, Ingrid Neel, Julia Elbaba, Katerina Stewart and Caitlin Whoriskey also picked up first round wins today. The men's events are a $10,000 Futures in Buffalo, NY and a $15,000 Futures in Tulsa, Oklahoma. As usual, there are many current and former college players in the draws. Virginia's Ryan Shane won his first round match in Buffalo, with juniors Nicolas Podesta, Dan Kerznerman and Catalin Mateas among those who qualified. In Tulsa, 2013 Kalamazoo 18s winner Collin Altamirano and finalist Jared Donaldson both picked up victories in the first round, with Altamirano beating Martin Redlicki 4-6, 6-2, 6-4 and Donaldson beating Dane Webb, the Oklahoma All-American 6-4, 6-2. Ernesto Escobedo, who lost in the quarterfinals in Kalamazoo last year, defeated 2012 Kalamazoo 18s champion Dennis Novikov 6-3, 7-6(1) in the first round today. Jarmere Jenkins, who elected to return from Europe without playing the Wimbledon qualifying, was required to qualify in Tulsa, and he is the No. 1 seed in the tournament now that he has. It's worth noting that Altamirano, Donaldson and Escobedo will all probably need wild cards to compete in Kalamazoo this year. The first day of qualifying at Wimbledon was a good one for US men, with nine of the 11 in action moving on to the second round. Tim Symczek(3), Denis Kudla(9), Ryan Harrison(22), Alex Kuznetsov(26), Rajeev Ram(31), Dan Kosakowski, Rhyne Williams, Wayne Odesnik and Bobby Reynolds all picked up wins. Only Chase Buchanan and Austin Krajicek were defeated in the opening round. 2011 boys champion Luke Saville of Australia upset top seed Thomaz Bellucci of Brazil, and No. 2 seed Go Soeda of Japan was also ousted, losing to Austrian veteran Martin Fischer. Both US doubles teams in qualifying also advanced, defeating seeded teams. Kevin King and Ryan Harrison defeated No. 3 seeds Rameez Junaid of Australia and Philipp Marx of Germany 5-7, 6-4, 6-4, while Smyczek and Kudla downed No. 2 seeds Sanchai and Sonchat Ratiwatana of Thailand 4-6, 7-6(5), 9-7. Nine US women, the most of any country, begin qualifying play on Tuesday. Madison Brengle, Melanie Oudin, Allie Kiick, Shelby Rogers, Grace Min(22), Nicole Gibbs, Vicky Duval(15), Sachia Vickery and Irina Falconi will join the nine remaining US men on the Roehampton courts Tuesday. For the schedule and draws, see the Wimbledon website. More on today's qualifying matches can be found here. The acceptances for July's USTA National Clay Court tournaments were released today, with these acceptances the first for a gold ball event under the new junior competition structure adopted by the USTA. To no one's surprise, the strict adherence to the sectional quotas for selection has produced some mismatched rankings and entries, with players with much higher national rankings placed in qualifying, while sectionally endorsed players with lower national rankings are placed in the main draw. 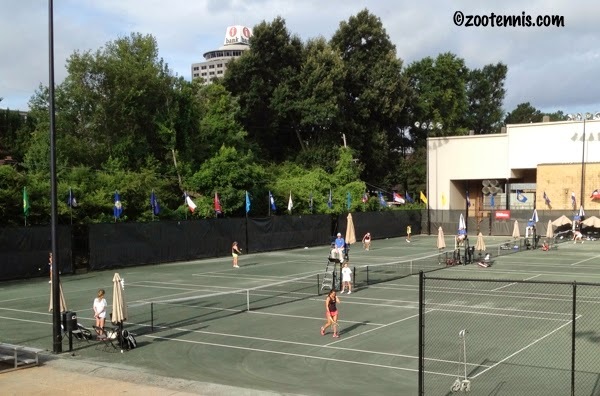 For example, at the Girls 18s Clay Courts in Memphis, which I've covered for the past six years, No. 59 Mia Horvit, the 2012 16s Clay Court champion, is in qualifying. Elizabeth Yao of Northern California, who is No. 14 in her section (eight get in from that section, but not all entered), is in the main draw, despite her national ranking of 812. Alex Rybakov, who is No. 25 in the ITF world junior rankings and was a direct acceptance into the Wimbledon Junior championships, is in the qualifying draw of the Boys 18s Clay Courts, and Zeke Clark, the Easter Bowl 16s finalist, is in the qualifying for the Boys 16s Clay Courts. This disparity was widely predicted when the system was introduced, but not considered by the USTA as detrimental to its ultimate goal of earned advancement. It will take more than this year's tournaments to determine whether that's the case, after there is enough data to say whether these nationally lower-ranked players who get in via a sectional endorsement have lower national rankings simply because they have stayed and played within their section. Or, if the quota system is discouraging good players from competing in the USTA system, leaving the USTA's national gold ball tournaments with fields that do not contain the country's best players. 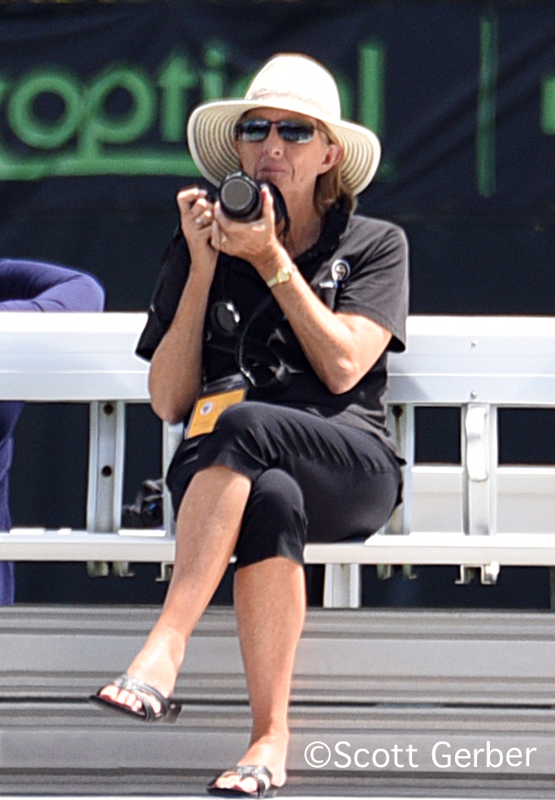 Lisa Stone at Parenting Aces has looked at all of the acceptances for all of the Clay Court tournaments and I encourage you to read her explanation of it. There's no question the issues raised by the Clays will be magnified significantly for the Hard Courts, where, in the 18s, a US Open main draw wild card is on the line. Qualifying for Wimbledon begins on Monday with the men, including 11 from the United States. Among the 128 players competing for 16 qualifying places are: Rhyne Williams, Austin Krajicek, Tim Smyczek(3), Alex Kuznetsov(26), Wayne Odesnik, Bobby Reynolds, Denis Kudla(9), Dan Kosakowski, Chase Buchanan, Rajeev Ram(31) and Ryan Harrison. Wimbledon also has doubles qualifying, and two teams from the US are also entered in that: Harrison and Kevin King and Kudla and Smyczek. The United States and France are tied for the most players in men's qualifying with 11; Germany has 10. Italy has seven, but unfortunately not Gianluigi Quinzi, the 2013 boys champion. He's won three straight Futures titles in May, so it's unfortunate he's not in Wimbledon qualifying. The competition begins at 11 am in London Monday at Roehampton. The schedule is here. The draws are here. Louisa Chirico picked up her first ITF Women's Circuit $25,000 title in Padova, Italy today, coming from 5-1 down in the final set to beat Paul Goncalves of Brazil 6-2, 1-6, 7-6(3). The 18-year-old New Yorker has always been comfortable on clay; last year at this time she had just reached the semifinals at the French juniors. Mitchell Krueger was unable to make it a US sweep in Italy. The 20-year-old from Texas, seeded second, lost in the final of the $15,000 Futures in Naples, to top seed Luca Vanni of Italy 6-3, 6-3. At the Grade 1 ITF tournament this week on red clay in Germany, top seeds Matias Zukas of Argentina and Iryna Shymanovich of Belarus took the titles. Only two US girls were in the draw, with Abi Altick and Olivia Hauger losing in the second round. Zukas beat fellow Argentine Francisco Bahamonde, the No. 5 seed, 2-6, 6-4, 6-2 in the final. Shymanovich, who reached the quarterfinals at the French juniors before losing to champion Darya Kasatkina of Russia in three sets, beat No. 15 seed Tamara Zidansek of Slovenia 5-7, 7-6(2). 6-1 in the final. Unfortunately, the Grade 2 always held in Halle Germany this coming week was cancelled, so preparation for Wimbledon juniors will be confined to Roehampton's Grade 1, which begins next Sunday. The weekend is rarely the time for big college hiring announcements, but the University of Michigan bucked that trend today, naming Pepperdine's Adam Steinberg as its men's head coach. Steinberg was considered one of the front runners for the position, and with the consolidation of power in the BCS conferences, it's no surprise he would consider moving to one of them. Pepperdine has a impressive tennis history, to which Steinberg has contributed greatly, leading the program to its only NCAA team title. But the recent talk of an NCAA Division 4 for high-revenue major athletic departments must concern any coach employed by one of the "have-nots". Steinberg takes over from Bruce Berque, who was let go last month after ten years. The Michigan release does not mention current associate head coach Jeremy Wurtzmann, although he is listed on the coach's roster. The Pepperdine release is here. Division III men's tennis lost one of its superstars, with Chris Garner leaving Amherst to take the head coaching job at Navy. In his seven years at Amherst, Garner won two team titles, most recently last month, and reached the finals on two other occasions. Garner, who played at Georgia and was an assistant coach at Ohio State, takes over from John Officer, who retired in April after 29 years as head coach. The Navy release is here. The ITF Grade 4 International Grass Court Championships were decided today in Philadelphia, with Ingrid Neel and Miomir Kecmanovic of Serbia taking the titles. Rain caused matches to be played indoors on at least two days, but the tournament did finish on time. 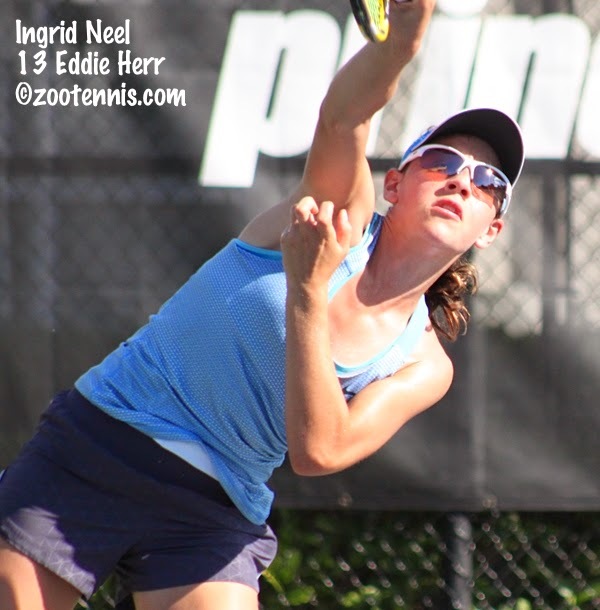 Neel, who trains at the IMG Bollettieri Academy in Bradenton, doesn't play outside Florida very often, but her game is well suited to grass, and she reached semifinals in Philadelphia last year. The No. 8 seed defeated No. 3 seed Francesca DiLorenzo 7-6(8), 6-3 in the final. It's the second ITF singles title for Neel, who turns 16 on Monday. Kecmanovic, who like Neel, trains at Bollettieri's and won the the Grade 4 in Coral Gables last month, has lost only one match in the six Grade 4s he's played this year, in the final last month at Delray Beach. The No. 2 seed, Kecmanovic, just 14, defeated No. 4 seed Myles Schalet 6-1, 6-3 in the Grass Courts final. Those three games are the most he lost in any set in his five victories. Kecmanovic has lost only four sets while posting a 31-1 record in junior competition this year. Sophie Chang and Andie Daniell, who won a $10,000 women's doubles title last month, won the girls doubles championships. The top seeds defeated unseeded Claire Liu and Ryan Peus 6-3, 6-3 in the final. The boys title went to Caleb Chakravarthi and Evan Zhu, who defeated Schalet and Gabe Tishman 7-5, 4-6, 10-4. Both teams were unseeded. At the ITF Grade 4 in El Salvador, Canadian qualifier Isabelle Boulais, 14, swept the titles. Boulais defeated top seed and Georgia Tech recruit Alexis Prokopuik, also from Canada, 6-3, 6-0 in the final. Boulais and Tiffany Lagarde of Canada won the doubles unseeded, beating top seeds Prokopuik and Stephanie Nemtsova of the US 7-5, 4-6, 10-5. Nik Scholtz of Ole Miss won his second consecutive $10,000 Futures title in his home country of South Africa. The unseeded Scholtz defeated No. 3 seed Fritz Wolmarans, also of South Africa, 4-6, 6-2, 6-4 in the final. Top seeds Ruan Roelofse(Illinois) and Dean O'Brien(Georgia Tech) won the doubles title, beating Scholtz and Tucker Vorster(Ole Miss), the No. 2 seeds, 7-6(6), 6-4 in the final. In the $10,000 Futures in Israel, Peter Kobelt, the recent Ohio State graduate, reached the finals in singles and won the doubles, with former teammate Devin McCarthy. Kobelt, who had to qualify, lost to top seed Sam Barry of Ireland 6-4, 7-6(5) in the singles final. The third-seeded Kobelt and McCarthy cruised to the doubles title, winning every match in straight sets. They defeated No. 4 seeds Alexander Mozgovoy of Russia and Sebastian Wagner of German 6-1, 6-2 in the final. Louisa Chirico, the 18-year-old New Yorker who recently signed with the sports management firm Octagon, reached the second $25,000 tournament final of her young career today in Italy. Unseeded, Chirico has beaten No. 8 seed Gioia Barbieri of Italy, No. 1 seed Aliaksandra Sasnovich of Belarus and No. 7 seed Anastasia Grymalska of Italy to reach the final. She plays unseeded Paula Goncalves of Brazil in the championship match Sunday. 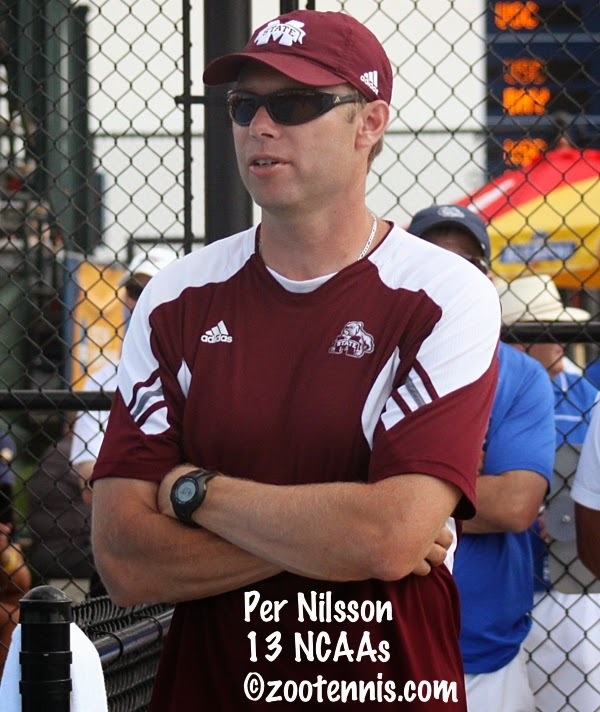 Per Nilsson, who has been men's head coach at Mississippi State for seven years, has been named women's head coach at Pepperdine. Nilsson, who was the men's assistant at Pepperdine from 2003-2007, will take over from Gualberto Escudero. Escudero led the Waves for 37 years, and he will remain at Pepperdine as associate head coach. Nilsson's departure from Mississippi State is covered in its release, and his arrival in Malibu is covered in the Pepperdine release. In other college news, Idaho has hired Mariana Cobra as women's head coach. She replaces Myriam Sopel, who left in January for University of Texas-El Paso. Cobra was previously at Northern Iowa. LSU has hired Georgia men's volunteer assistant Tristan Venables as assistant to Julia Sell in the women's program. Steve Smith, a long time private coach in Tampa (and father of Connor Smith) has moved to Raleigh and will be serve as the volunteer assistant for the men's program at North Carolina State. The 17 USTA Sections throughout the country will be able to take advantage of the Team USA Area. The eight hard courts and eight clay courts can be used by USTA Section coaches and players to work on their own, or collaboratively with USTA Player Development. In the winter, USTA Section coaches and players in northern climates who would find local indoor court costs prohibitive could fly down to Orlando for a week or two to use the facilities at no cost. There's much, much more, so if you are interested in the project, you can read the blog post here. Reports today have additional wild cards going to Vera Zvonareva of Russia, Silvia Soler-Espinosa of Spain and Jiri Vesely of the Czech Republic. The sectional playoffs for the US Open qualifying wild card in men's and women's singles and a main draw wild card in mixed doubles began last month, but with the NCAAs and the French Open, I haven't had time to post about them until now. Three of the 13 sectional competitions have been completed: Southwest, which ended May 20, Mid-Atlantic, which ended June 3, and Southern California, which wrapped up today. Former Arizona State All-American Jacqueline Cako won the women's tournament and the mixed doubles tournament in the Southwest sectional qualifying. Cako defeated 16-year-old Savannah Slaysman in the final via a walkover, with Slaysman unable to compete due to illness. Former University of Minnesota player Chris Wettengel won the men's singles tournament, beating Joel Kielbowicz(UNLV) 6-1, 6-0 in the final. Cake and Kielbowicz won the mixed doubles with a 6-0, 7-6(3) victory over Carol Finke and Brett Morse-Karzen. In the Mid-Atlantic tournament, Skylar Morton, who played at UCLA from 2011-2013, won her second women's title, beating Nika Kukharchuk 6-3, 4-6, 6-1 in the final. Former Dartmouth player Alexander Centenari won the men's tournament, beating South Carolina freshman Harrison O'Keefe 5-7, 7-6, 6-1 in the final. In the mixed doubles competition, Jessica Keener and Matt Stillwagon advanced to the national playoffs with a 6-4, 6-2 win over Sydney Rider and Shane Monroe. For reasons that continue to elude me, the Southern California section always features small draws and this year, the fifth of the competition, was no exception. Duke freshman Dan McCall won the men's title in a 21-player draw, beating former St. John's player Dustin Goldenberg 6-1, 6-4 in the final. Fifteen-year-old Kelly Chen won the women's draw in a 18-player draw, beating USC junior Zoe Scandalis 6-4 6-3 in the final. USC Associate women's coach West Nott and senior Kaitlyn Christian won the mixed doubles title in a draw with seven teams. Nott and Christian defeated Pam Montez and Andrew Scorteanu 6-1, 6-1 in the final. The men's and women's singles winners will compete in the National Playoffs in New Haven, Connecticut August 15-18. The mixed doubles nationals are August 19-22, also at Yale. The Eastern section's tournament is winding down, and New England's tournament has just begun. Only one tournament is still open to entries--the Southern section's deadline is tomorrow. For links to all the TennisLink sites, see this page. For more on the completed events, see this page. The Honda Award, given annually to women in 12 collegiate sports, went this year to UCLA's Robin Anderson, the Most Outstanding Player of this year's NCAA team championships. Anderson was selected as the tennis winner over finalists Danielle Collins of Virginia, Jamie Loeb of North Carolina and Lynn Chi of Cal. For more on Anderson's award, see the UCLA website.